Eighty one percent of customer experience (CX) leaders report they will compete mostly or entirely on CX, but less than half have established the rationale for why CX drives business outcomes, according to research firm Gartner. The goal of CX is to meet and exceed customer expectations, but while almost 50 percent say their CX efforts exceed management’s expectations, just 22 percent of customer experience leaders report their CX efforts exceed customers’ expectations. The Gartner CX Pyramid (see below) is a framework to understand what separates the most powerful customer experiences from the rest. Each level, from bottom to top, defines an incrementally stronger way to forge relationships between an organisation’s brand and their customers based on the way CX leaders listen for, understand, act on and solve customer needs. Stage 1: Communication Level – Furnish customers with the information they can use via the right channel at the right time. Stage 2: Responsive Level – Solve the customer’s problem quickly and efficiently – meaning, balance both business and customer goals, measures and strategies. Stage 3: Commitment Level – Listen for, understand and resolve customers’ unique needs. 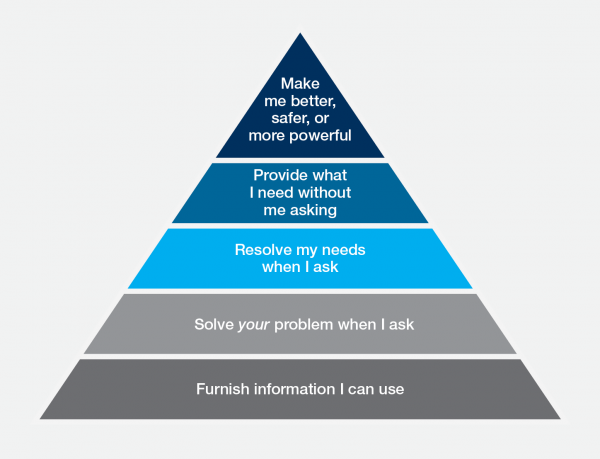 Stage 4: Proactive Level – Provide experiences that resolve needs before customers ask. Stage 5: Evolution Level – Make customers feel better, safer or more powerful. Assess Your Capabilities – Ensure they’re capuring a thorough understanding of customer wants, needs, and expectations, not just their perceptions of your existing initiative. Tailor Your Customer Journey Maps – Push experiences in the top of the CX pyramid at key touchpoints and drive customers deeper into the buy, own and advocate journey. Measure Your More Innovative CX Efforts Differently – CX leaders must make sure to measure their more innovative customer experiences against adoption, perception and financial objectives.